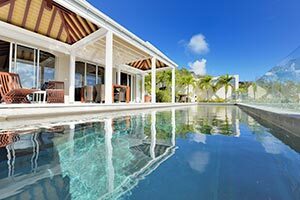 Villa UJV 167, also referred to as Plein Ceiel, is located in Marigot, St Barts, hillside with a view over Marigot Bay, Cul de Sac and Mont Jean. A very open villa combining Asian and African styles. The living area has a beautiful dark rattan woven sofa with rich reddish brown overstuffed cushions and Asian teak armchairs. This area is light and bright as it opens onto the pool area in front and a pretty courtyard to the back and a magnificently lit garden in the evening. The dining room has a large dark wooden table, which goes beautifully with the minimalist style of the dining area. The kitchen is modern with wooden and glass cabinets, stainless steel fixtures and granite countertops, fully equipped and separated from the dining room by a high bar. The master bedroom has an ensuite large bathroom with access to a private deck with a Jacuzzi built into the rocks. The two other bedrooms share a bathroom and are decorated in a similar Asian style and TV in each bedroom. The pool is 12 meters long and has steps leading into it and a sitting ledge that runs the length of the pool. Teak chaise lounges line the surrounding terrace. A very private convenient and secure location. Built on one level with the ability to accommodate handicapped people and small children if necessary. A 4WD drive vehicle is recommended for the steep driveway.